Other than preventing you from squinting at the small text, it’s also genuinely useful for social gatherings if you want to give people an easier time to adjust playlists and music. Increase the font size and throw iTunes in full screen mode and enjoy your BBQ. 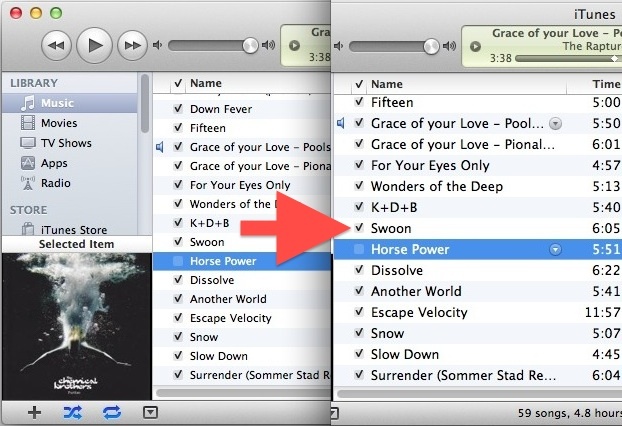 Similar font size adjustments can be made with a right-click from within Cover Flow album art view as well. Is that a taylor Swift song? But no, it’s all electronic music. Chemical Brothers and Poolside are in the iTunes screenshot. Excellent tip, this never even crossed my mind to look for in prefs and it’s MUCH more readable on my 1080p display, thanks for this!